"Elisabeth Grümmer was one of a wonderful constellation of German lyric sopranos who dominated the Central European opera houses and concert halls in the 1950s and '60s." 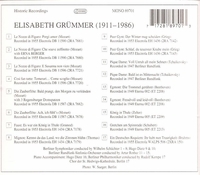 "Elisabeth Grümmer was one of the best German lyric sopranos of the 1950's and 60s….the listener will be struck by [her voice’s] beauty, its evenness and smoothness over its entire range. Grümmer was a stylish singer who colored her voice well and gave convincing portrayals of her operatic heroines."